When you own an AcuRite color weather station you have a special weather instrument. The first thing that you will really enjoy is the colored screen. The illuminated color display with adjustable dimmer, and is electric-powered with optional battery backup, for your convenience. Secondly it monitors both the indoor and outdoor temperature for you. It also records the daily high and low temperature and then it will let you know whether the temperature is trending upwards or downwards. It does this with an upward arrow or a downward arrow. The third feature in the highlights is the humidity level icon which conveys a low; high; or ideal humidity level for your indoor environment. Fourth it’s wireless all-weather outdoor sensor features the wireless range of up to 330 feet (100 meters). Fifth it will provide a self learned unique to your location, 12 to 24-hour weather forecast. This forecast is done by using colorful icons for sunny; partly cloudy; cloudy; rain; snow and rain/snow mix. Yes but It is concave in the back with a slight curvature which really restricts wall mounting. Also, this particular model is very hard to read from any distance. Can you switch between Celsius and Fahrenheit temperatures? It is my understanding there is no ‘adjustment’ you can make to the barometer reading. The unit will settle down in the first month to a reading within +/- .01-.02 usually. You can compare the readings to a National Weather station located near you as a guide of it’s accuracy. What is the coldest temp it can display? The temperature range for this model is -40 to 158 degrees Fahrenheit; -40 to 70 degrees Celsius for the sensor and the indoor temperature range is 32 to 122 degrees Fahrenheit; 0 to 50 degrees Celsius. What size of batteries does it use? Uses 3 “AA” batteries in base unit and 2 “AA” batteries in outdoor sensor. Is this atomic time or do you have to set it each time? Does It come with a power cord? and if so how long is the AC adapter cord? This weather station from AcuRite, the AcuRite 02077RM has the patented self-calibrating technology that has been used for a few years now. This very interesting technology provides an accurate; personalized forecast of 12 to 24 hour weather conditions. The unit also possesses a built-in Intelli-Time clock which you will find will work well for you because it updates itself and even accounts for daylight savings time on it’s own. The outdoor sensor has powerful wireless technology, and is found to be housed in a weather-resistant construction and an integrated hanger for easy mounting. The color weather station display stands upright for tabletop use or is wall-mountable. So either way you will find the perfect spot as a home for your AcuRite 02077RM. This weather station comes with a 4 foot AC/DC adapter power cord as a backup. It also works on batteries. Lithium batteries are suggested for the outside sensor and regular batteries for the display unit which is inside use. The batteries needed are “AA” sized batteries, 2 are needed for the sensor and 3 are needed for the display. So in looking at this model it looks as it would be a great purchase for the following types of people. A person who is on the run. All they need is a quick glance to get the temperature, whether it’s rainy or snowing outside right now, and then what is it going to be like in the next 12-24 hour time period. A younger weather fan. While this personal weather station is a simpler one, it would make for a great learning experience and gift idea for the younger upcoming weather geek. It is important to realize that this would not be enough of a weather station for a more sophisticated and/or advanced weather fan. You would want to look at a more professional level type of personal weather station to satisfy that type of person. So all of the AcuRite weather instruments are rated highly by owners and new purchasers. I see that many are happy owners of this AcuRite model. They are very pleased with the craftsmanship of the station and the reliability of the parts. They do their job and they do it well. So I would rate this model #02077RM as a 4.5 star rating. The right person will find hours of pleasure and the person should find the sensor and display to be unfailing. The latest exciting home weather station selection from Acu-Rite is featured in this review. We take an in depth look at the morning, noon & night precision forecaster this is included in this station. This is a deep examination of the AcuRite 75077 Weather Forecaster. I have tried to be more thourough than others might be. AcuRite's Color Weather Station delivers all the features you need to plan your day with confidence. Setup is effortless. Simply place the wireless temperature and humidity sensor outdoors using one of the integrated mounting options. The sensor wirelessly transmits your weather data to an attractive, easy-to-read, illuminated color display for quick access to vital information. • and a handy Humidity Level Icon that lets you know if your home is at a safe and comfortable level. The integrated Intelli-Time clock comes pre-programmed with the correct time and date. And it automatically updates itself for Daylight Saving Time. 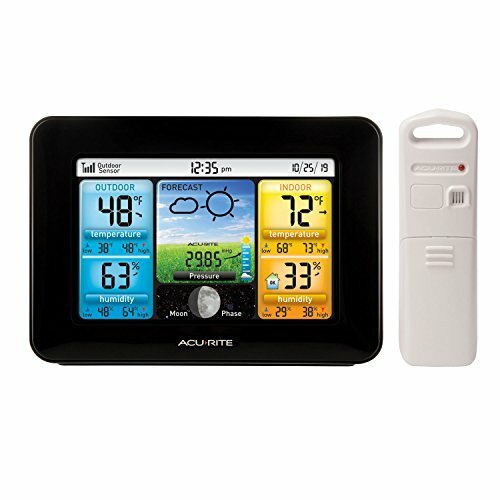 Enjoy the weather and time information you need, at-a-glance, with the AcuRite Color Weather Station.